There is nothing better than your mother’s home cooked food, and that is something a lot of Marist College students miss when they are at school. Home cooked meals are hard to come by when we are surrounded with nothing but cafeteria food options. The cafeteria is a great place to get quick, and easy meals, but if you want to change up your diet and indulge in some good comfort food then you’ll find yourself right at home at the Matchbox Café. The Matchbox Café is a great option when it comes to finding delicious tasting and comforting food. The red sign on the building reads “Comfort food and Cookies” and that is certainly what they serve up in the little stone cottage that sits on the side of Route 9. On the menu they mention items that are meant for sharing, and those that take a little bit more time to prepare. An impatient customer asked why his food was taking so long to prepare, but co-owner Joanne Cohen replied with a calm, “good food takes time”, and she was right. As soon as the waiting customer got his meal he was all smiles! When it came time to try a little bit of everything the food did not disappoint. Choosing just one item off their lengthy menu was impossible to fellow Marist student Kerianne Baylor and I so we opted for the three-egg omelet with cheese, toast, hand cut fries, and their famous cheeseburger. The omelet and burger were presented on paper plates, “We call it the Matchbox because it’s so small. Because it’s so small, we don’t have china plates and cups (there’s simply no room).” The laid back atmosphere allows customers to feel at home, and comfortable while they indulge in comfort food and cookies. Owners, Sam and Joann Cohen have been in the food industry for over 20 years from starting in New York City with their Dessert Delivery service located on the Upper East Side they wanted to expand their delicious treats to the Hudson Valley. This husband and wife duo certainly know how to make their customers feel at home while they dine, as Sam delivers each meal on a large black tray with a smile across his face. In 2012 the café won “Best Dessert” at the Taste of Rhinebeck for their Absolutely the best red velvet cake, and Oprah Winfrey gave them her stamp of approval for the same red velvet cake. While indulging in comfort food Kerianne Baylor a Marist student and I had to try the famous red velvet cake and it was love after first bite. Baylor remarks, “the ratio of frosting to cake is absolutely perfect, and the cake is moist and tasty!” Pastry chef and co-owner of the Matchbox Café, Sam Cohen explained that, “we use beet juice and cream cheese, not dye like the fake stuff.” Revealing the secret to his famous red velvet cake really explained why it has won so many awards, and why Oprah loves it as well. The pumpkin cheese pie was just right and fitting for the upcoming holidays that are centered on fall flavors. Also, the massive ¼ pound, big, fat assorted flavor chocolate chip cookie was to die for. Sam prepares all of the baked goods at their bakery in NYC and safely transports the deliciousness himself to the Matchbox Café for residents of the Hudson Valley to enjoy. Tom and Penny, residents of the Hyde Park area told us, “we try and make it to the Matchbox Café as much as we can. If you have time try the authentic fried chicken that is cooked slowly to perfection in a skillet” remarks Penny. They too understand how much time it takes to make food that will never disappoint. There are so many different options and combinations offered at the café, and anyone from vegetarians to meat eaters will find something they will enjoy at a reasonable price. Prices range from $4.50 for eggs and French fries to $21.50 for their Night Time Nachos that will not disappoint, and are a great item to share with friends. Comfort food really has a way of bringing friends and family together, and at the Matchbox Café Sam and Joann have really made their mark. The Matchbox café is the definition of hidden gem as it sits on the side of Route 9 heading towards Rhinebeck, and is marked with a wooden sign that reads “Matchbox Café…stay nice”. The stone cottage that lines the road has an inviting and homey feel from the moment you step out of the car to the second you lay your eyes on their desserts that line the countertop. It is impossible to leave this establishment unsatisfied because no matter what your favorite home cooked dish is, they are sure to please. From breakfast, lunch, dinner, and dessert the Matchbox Café has it all. Freshly prepared and made with only the best of ingredients as they mention their local eggs, and grass fed meats. Customers will know the food that is placed in front of them is fresh, local, and delicious. Joann explains, “we are off the road kind of people” and those places are the best places. 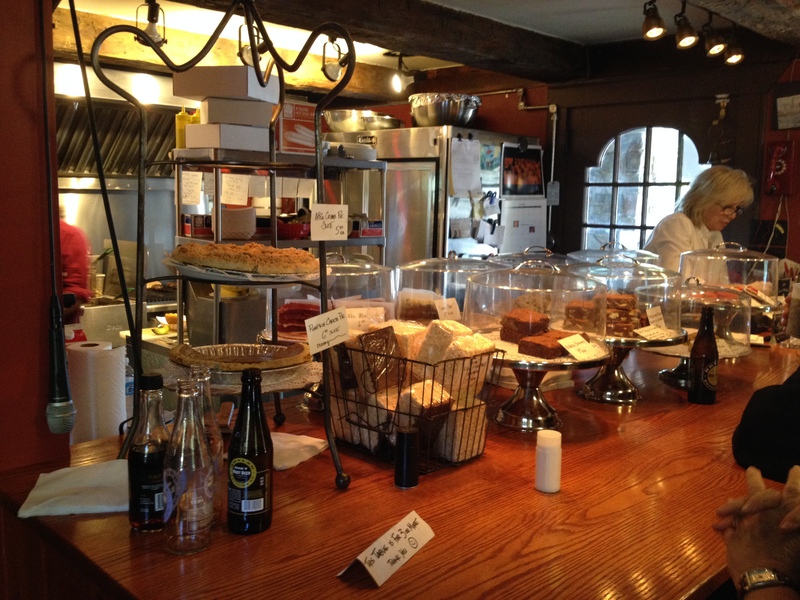 Filled with love, warmth, and positive vides the Matchbox café is located at 6242 Route 9 in Rhinebeck, New York. They are open Wednesday through Monday from 9:30 a.m. to 8:00 p.m. When you find yourself missing your mother’s home cooked food, and grandmother’s favorites take a drive to the Matchbox Café, and they will be sure to satisfy all your comfort food needs. This entry was posted in Hidden Gems, Lifestyle. Bookmark the permalink.